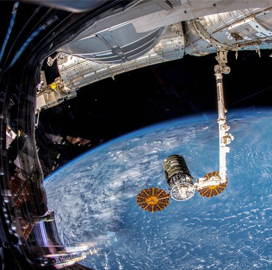 Northrop Grumman‘s Cygnus spacecraft left the International Space Station on Friday after delivering 7.4K pounds of scientific equipment and crew supplies as part of the NG-10 cargo resupply mission. The space vehicle, nicknamed as S.S. John Young, stayed on the orbiting laboratory for 81 days and repositioned itself above the station to begin the deployment of multiple CubeSats during the mission’s second phase, Northrop said Friday. Cygnus will aim to field four CubeSats via the SlingShot CubeSat and NanoRacks External Cygnus deployer platforms. The spacecraft will also deploy a separate payload antenna from UbiquitilLink to test communications capabilities from areas lacking ground-based network coverage. The NG-10 mission launched Nov. 17 from NASA’s Wallops Flight Facility in Virginia and would also dispose of 5,500 pounds of cargo from the ISS. Northrop aims to conduct in spring its final launch under the Commercial Resupply Services-1 contract, which the company inherited through its $9.2B acquisition of Orbital ATK.